On Tuesday, Tennis Canada announced that Leylah Annie Fernandez, who celebrated her 16th birthday in September, is the recipient of the 2018 Rene Simpson-Collins Excellence Award, which recognizes a junior girl who embodies the same values and qualities as the award’s namesake. The annual honour in memory of the former player, coach and Fed Cup captain will be presented to Fernandez along with a $2 000 scholarship to help offset some of the costs related to her training and development. Fernandez’s 2018 season was nothing short of spectacular. 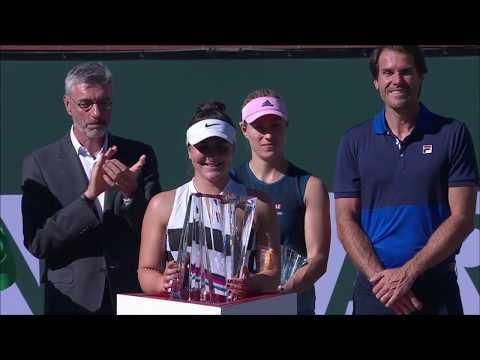 She reached the semifinals at the Roland-Garros Junior Championships and the quarterfinals at the US Open Junior Championships before going on to raise the winner’s trophy at the ITF Junior Masters in China. She ended the year as World No.14 and then rose to No.5 following her appearance in the final of the 2019 Australian Open Junior Championships. On the WTA Tour, she made it past the first qualifying round of Rogers Cup presented by National Bank and, a few weeks later, defeated fellow Canadian Gabriela Dabrowski in the opening round of National Bank Cup presented by IGA, posting her first win in the main draw of a WTA event. Fernandez is the third player to win the Rene Simpson-Collins Excellence Award. She follows in the footsteps of Bianca Andreescu (2016) and Katherine Sebov (2017). A Rene Simpson-Collins Excellence Award will also be presented to a female tennis coach who demonstrates the potential to reach the highest levels of coaching excellence in Canada. The $2 000 scholarship is administered through the Tennis Professionals Association (TPA) on an annual basis. For many years, Simpson-Collins was an important and influential member of the Canadian tennis community. During her years playing on the professional circuit, she reached a career-high ranking of World No. 70 before helming the nation’s Fed Cup team as captain from 2001 to 2010. She passed away in October 2013 after a year-long battle with brain cancer. This award was created to honour her legacy in developing Canadian women’s tennis and her positive and long-lasting contributions both on and off the court. The award is presented each year to a young female player who has shown the potential to reach the highest levels of tennis internationally, while also exhibiting the same values Simpson-Collins believed in, including sportsmanship, professionalism, honesty, integrity, courage, pride and passion. Dec 04, 2017 QUIZ: How well do you know teen sensation Denis Shapovalov?